This extraordinary, magical novel is the story of Clare and Henry who have known each other since Clare was six and Henry was thirty-six, and were married when Clare was twenty-two and Henry thirty. Impossible but true, because Henry is one of the first people diagnosed with Chrono-Displacement Disorder: periodically his genetic clock resets and he finds himself pulled suddenly into his past or future. His disappearances are spontaneous and his experiences are alternately harrowing and amusing. 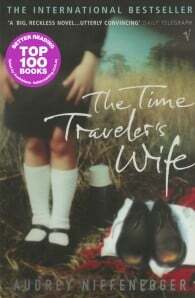 The Time Traveler’s Wife depicts the effects of time travel on Henry and Clare’s passionate love for each other with grace and humour. Their struggle to lead normal lives in the face of a force they can neither prevent nor control is intensely moving and entirely unforgettable. Audrey Niffenegger was born in 1963 in the idyllic hamlet of South Haven, Michigan. Her family moved to Evanston, Illinois when she was little; she has lived in or near Chicago for most of her life. She began making prints in 1978 under the tutelage of William Wimmer. Miss Niffenegger trained as a visual artist at the School of the Art Institute of Chicago, and received her MFA from Northwestern University’s Department of Art Theory and Practice in 1991. She has exhibited her artist’s books, prints, paintings, drawings and comics at Printworks Gallery in Chicago since 1987. In 2013, a major mid-career retrospective of Miss Niffenegger’s prints, paintings and artist’s bookworks opened at the National Museum of Women in the Arts in Washington, DC. In 1997 Miss Niffenegger had an idea for a book about a time traveler and his wife. She originally imagined making it as a graphic novel, but eventually realized that it is very difficult to represent sudden time shifts with still images. She began to work on the project as a novel, and published The Time Traveler’s Wife in 2003 with the independent publisher MacAdam/Cage. It was an international best seller, and has been made into a movie. In 1994 a group of book artists, papermakers and designers came together to found a new book arts center, the Columbia College Chicago Center for Book and Paper Arts. Miss Niffenegger was part of this group and taught book arts for many years as a professor in Columbia College’s MFA program in Interdisciplinary Book and Paper Arts. She is now on the faculty of the Columbia College Fiction Writing Department. Miss Niffenegger has also taught for the Newberry Library, Penland School of Craft and other institutions of higher learning. Miss Niffenegger’s second novel, Her Fearful Symmetry, was published in 2009 by Scribner (USA), Jonathan Cape (UK) and many other fine publishers around the world. In 2008 she made a serialized graphic novel for the London Guardian,The Night Bookmobile, which was published in book form in September, 2010. In 2013, the illustrated novella, Raven Girl, was published in conjunction with the Royal Opera House Ballet production of Raven Girl, which was choreographed by Wayne McGregor. Currently, Miss Niffenegger is working on her third novel, The Chinchilla Girl in Exile.